The college bowl season kicks off this Saturday. And while the betting public will primarily be fixated on the upcoming BCS Bowl Series and national title game, I am going to focus my attention on the bowls featuring the mid-majors. These early bowl games tend to stay well under the radar but can add a tremendous amount of value to your overall betting strategy if you know where and how to look. I finished the regular season 21-19-2. And with ample time to thoroughly dissect the first three matchups on the bowl game schedule, I am confident all three will be winners. The following are my three top free football picks with lines provided by 5Dimes. The Rockets stumbled down the stretch a bit with two straight up losses in their final three games to fall to 6-2 SU in the MAC and 9-3 SU overall. They failed to cover the spread in four of their last six games to go 7-5 against the spread. Toledo brings a potent offensive attack that averaged 32.9 points a game into this matchup, but its defense gave up close to 30 points a game. Utah State completed a perfect 6-0 SU run in the WAC this season to claim the conference title. It went 10-2 SU overall and was an extremely profitable 10-1-1 ATS. This is another team that can put points on the board with an average of 34.4 points a game. The ground game is led by Kerwynn Williams, who rushed for 1,277 yards this season. 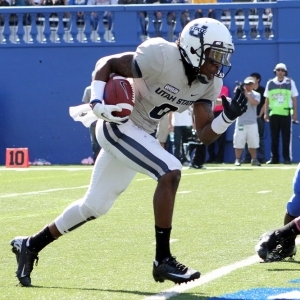 Overall the Aggies feature a rushing attack that averaged 282.7 yards a game this year. Toledo is 1-4 ATS in its last five games against the WAC and 1-3-1 ATS in its last five neutral-site games. The Aggies are 16-5-1 ATS in their last 22 nonconference games. The Rockets will be able to keep things interesting well into the second half, but look for Utah State to wear them down in the fourth quarter to get the win by more than 10 points. UCF’s last season in Conference-USA before joining the Big East next year ended with a 33-27 overtime loss to Tulsa as a three-point road underdog in the title game. The loss dropped the Knights to 9-4 SU on the year and 6-7 ATS. The one thing that carried this team all season long was a shutdown defense that held opponents to an average of 22.5 points a game. Ball State started the season 3-3 but reeled off six-straight victories to finish 9-3 both SU and ATS. It closed out play in the MAC at 6-2 SU with losses to Kent State and Northern Illinois. The big key for the Cardinals in this game is the health of quarterback Keith Wenning. He missed the season finale against Miami (OH) with a strained Achilles tendon, but he is listed as probable for this game on the latest injury report. The Knights are 5-2 ATS in their last seven games against the MAC and 13-5 ATS in their last 18 games following a SU loss. Ball State is 19-7 ATS in its last 26 nonconference games and 8-3 ATS in its last 11 games against a team with a winning record. Look for UCF to win this game outright, but the pesky Cardinals will be able to put up enough of a fight to cover with the seven points. The Pirates went 5-1 SU down the stretch to run their overall record to 8-4 SU and 6-6 ATS. The one loss to UCF ended up costing them a shot at playing for the C-USA title. The player to watch in this matchup is quarterback Shane Carden. He threw for 2,838 yards and 21 touchdowns while completing an impressive 66.8 percent of his passes. His top target was wide receiver Justin Hardy, who led the team with 83 receptions for 1,046 yards and 10 scores. UL-Lafayette finished a close second to Arkansas State in the Sun Belt at 6-2 SU in conference play. Overall, it went 8-4 SU and 7-5 ATS. This is another team that likes to air it out behind quarterback Terrance Broadway. He completed 65.1 percent of his passes for 2,526 yards and 16 touchdowns. He also proved to be a dual-threat with his legs by adding another 661 yards and eight touchdowns on the ground. East Carolina is 6-14 ATS in its last 20 nonconference games and 0-5 ATS in its last five games against a team with a winning record. The Ragin’ Cajuns are 6-13-2 ATS in their last 21 games against C-USA but 8-2 ATS in their last 10 nonconference games. This should end up being a high-scoring affair, so do not rule out a play on the “over” with the total set at 64. However, the play on the spread is with battle-tested UL-Lafayette. This is a team that almost knocked off Florida in early November as a 27.5-point road underdog.